Contact us for making a donation or donate those 2% of your income taxes for supporting Civitas Foundation’s local development activities. You will contribute directly to a cause you believe in. The effort is minimal: just fill in the 230 form if your income consists of your wages or the 200 form for other types of income. 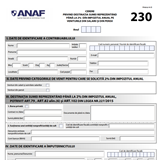 The forms must be personally submited at the ANAF office your home is subscribed to.